These ants get their name from their workers, who run in an erratic, jerky manner. Indoors: Underneath flooring or carpeting, in potted plants and wall voids. Outdoors: Shallow nests in soil near or under rocks, foundations, timber, etc. While mainly a nuisance pest, populations can be so large that they overwhelm conventional control strategies. 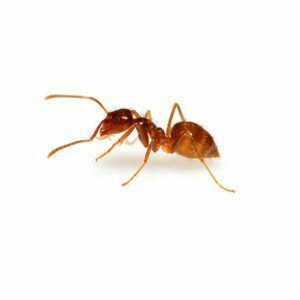 Tawny crazy ants tend to accumulate in electrical junction boxes, air conditioners, etc. When they amass around the electrical contact points, they can cause the equipment to malfunction. Dark brown to black with gray sheen/luster; 1/16 to 1/8 of an inch long. Throughout the United States. However, the tawny crazy ant is found mostly indoors in the north because of their inability to survive winter. Almost anything, but prefer live and dead insects, sweets, fruits, seeds and insect honeydew. Colonies contain about 2,000 workers and from 8 to 40 queens, and are easily adaptable to wet or dry conditions. As social insects, tawny crazy ants can be found in large colonies or groups of colonies that are indistinguishable from one another. They easily adapt to wet or dry conditions. Control of tawny crazy ants is very difficult when huge populations are present. There isn’t one nest to treat, but large areas where they occur in plague-like numbers. Perimeter treatments around buildings are usually overwhelmed by so many ants and need to be retreated often.